Rocketeer, The (film) In 1938 a young air racing pilot, Cliff Secord, and his partner Peevy discover a secret rocket pack that enables a man to fly. They quickly become entangled in international intrigue in their attempts to keep the device away from Nazi spies and other villains, including Hollywood matinee idol Neville Sinclair. 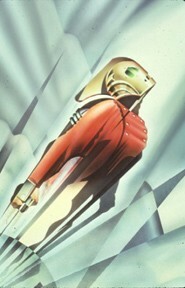 With the help of his actress girlfriend, Jenny Blake, Cliff, dubbed “The Rocketeer” by the press, embarks on a mission that could alter the course of history and make him a true hero. Released on June 21, 1991. Directed by Joe Johnston. 108 min. Stars Bill Campbell (Cliff Secord), Jennifer Connelly (Jenny Blake), Alan Arkin (Peevy), Paul Sorvino (Eddie Valentine), Timothy Dalton (Neville Sinclair). Based on a comic character created by Dave Stevens. The airport scenes were filmed in Santa Maria, California, where an airport was built in an area that could pass for Los Angeles in 1938. The Bulldog Cafe was based on an actual restaurant in Los Angeles built in the 1920s. Released on video in 1992.